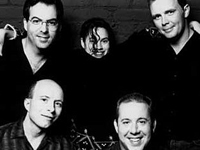 10,000 Maniacs was formed in 1981 in Jamestown, New York. The band began as Still Life later changed to Burn Victims and finally stuck with 10,000 Maniacs. The founding members were Dennis Drew on keyboards, Chet Cardinale on drums, Robert Buck on guitar, Steve Gustafson on bass guitar, and Terry Newhouse as vocalist. A short time later, Natalie Merchant and John Lombardo joined the band and Newhouse and Cardinale left leaving Merchant as lead singer. The first performance as 10,000 Maniacs was on September 17, 1981 with Natalie Merchant, John Lombardo, Robert Buck, Dennis Drew, Steve Gustafson, and Tim Edborg. The band experienced a high turnover in drummers beginning with Chet Cardinale and moving through Tim Edborg, Bob Wachter, and Jim Foti. In 1983, Jerry Augustyniak became the band’s permanent drummer. 10,000 Maniacs recorded 12 albums from 1981 through 2006. Co-founding member John Lombardo left the band in 1986 and joined Mary Ramsey to form a folk band, John and Mary. Interestingly, when Natalie Merchant left to pursue a solo career in 1993, John and Mary were asked to join back up with the band, which they did and Mary Ramsey took over as lead vocalist. A couple the band’s highlights include playing at President Clinton’s Inaugural Ball in January 1993 and playing with the Buffalo Philharmonic Orchestra in 2000. On December 19, 2000, the band lost one of their original members, Rob Buck died of liver failure at the age of 42. The concert with the Buffalo Philharmonic Orchestra was his last performance. After Buck’s death, the band re-grouped in 2002 with Steve Gustafson, Dennis Drew, Jerry Augustyniak, and new members Jeff Erickson as lead guitarist and Oskar Saville as lead vocalist. Mary Ramsey performed with this lineup during 2006 until re-joining John Lombardo in a new folk band, The Valkyries.